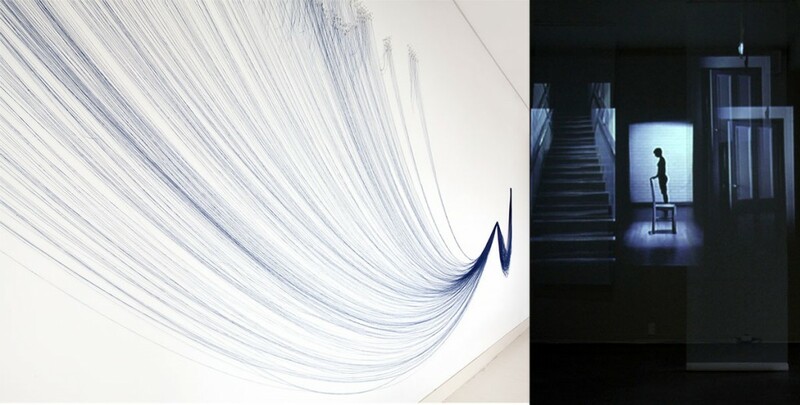 Slowing Down Time is a collaborative project by four artists working in different media: textile and sculpture, choreography, installation and moving image. The project starts with one work by one artist and evolves over the period of the exhibition as a new contribution is added each week. These responses culminate in a richly textured and layered work in the fourth and final week of the exhibition. The artists are Louise Curham, Michele Elliot, Jo Law, and Sue Healey. In common for the four artists is attentiveness to the materiality of everyday life such as gestures, domestic scenes, threads, clothes, hair, and furniture. Each iteration responds to the previous, materialistically building on what is there. The project’s ambition is to open up a dialogic space for artist to create works together. The aim is to produce a final piece with diverse parts that are consonant with each other—a reflective space where time is slowed down. The nature of this project pivots on an open dialogic process. Audience is invited to participate in a critical dialogue about the making process at the closing of this exhibition where the four artists will discuss the creative process of work.